The best of Bergen on one card! Enjoy free or discounted admission to museums and attractions, as well as cultural events, sightseeing tours, restaurants and parking. The Bergen Card lets you explore and get around Bergen in an efficient, practical and reasonable way. Experience the City of Culture and World Heritage City Bergen, visit the museums and the historic sites, see the exciting attractions, eat at the classic Bergen restaurants and even have time to spend the evening at a theatre, cinema or at a concert. You also get free or discounted admission to museums and attractions, as well as cultural events, sightseeing tours, restaurants and parking. With your Bergen card in your pocket, you travel free on Bergen Light Rail and buses in the city centre and the surrounding region. You can even start using the card at the airport! You get a discount on the Airport Bus and with Bergen Light Rail the ticket is free! Buy the Bergen Card online and pick it up at Bergen Airport Flesland Service Center or at the Tourist Information in Bergen. You may choose to start your stay in Bergen with a sightseeing or fjord tour. Bergen is the Gateway to the Fjords, and departing from the Fish Market, you can go on a half-day trip to the beautiful Mostraumen, which is a full-value fjord experience with steep mountains, waterfalls and narrow fjords. Bergen is the city between the seven mountains, and the Fløibanen Funicular will take you up into the mountains in just six minutes. A great variety of activities are available on top of Mount Fløyen, with what may be the city’s best playground, a café and restaurant, and a great range of outdoor activities and walking trails. You will have views in all directions and it is considered the city’s most beautiful viewpoint. You can ride on excellent cycling paths or try fun spectacular zip-line. Bergen is a kid-friendly city. With the Bergen Card, your family will enjoy educational fun at VilVite science centre and you will get to know the many animals in and outside the water at Bergen Aquarium. 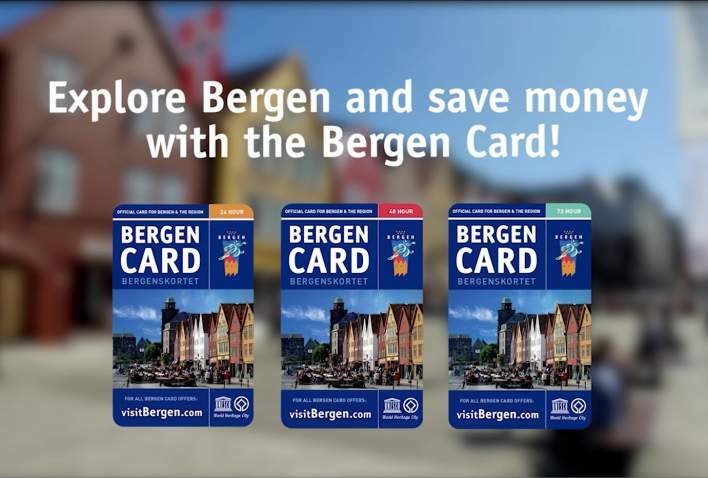 The Bergen Card gives you discounts on activities for the whole family. Buy the Bergen Card at visitBergen.com, the Tourist Information in Bergen and at most hotels and campsites in Bergen. You can also buy the Bergen Card on Fjord Line ferries. Take your pick among 24, 48 or 72-hour card. The more you see, the more money you save. See en.visitbergen.com/bergen-card for all products on offer in the Bergen Card. Some of the highlights you can enjoy with the Bergen Card!